Dear Danee, I would like to share with your followers in saying your homeopathic diet is without a doubt the best and most successful approach to eating I have ever accomplished. Losing 35 lbs. in less than a month was unbelievable and by following your plan, I have not put any weight back on. Being a male over 65 years old I never thought it possible and it was not something that was difficult. Once again, thank you for your help. 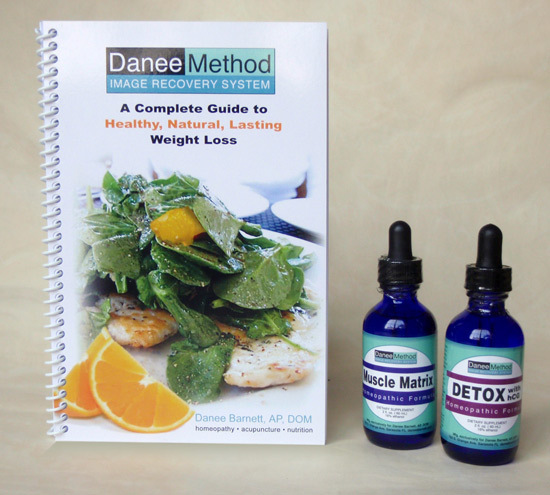 Dear Danee, When I first discussed your program with you, you said it was life-changing – and indeed it is! Now I not only have a thinner, better body, I am a happier, cheerier, kinder, better ME! Homeopathic medicines are therapeutically active nano-doses of mineral, botanical and biological substances. They have no known side effects, do not interact with other medications and are non-toxic. They are reliable and safe. Homeopathy is the second most commonly used form of medicine in the world. Homeopathy has been used around the world for over 200 years, building a remarkable safety record and generating a great body of evidence. During the 1918 flu pandemic, homeopaths reported around 1% mortality in their cases, while conventional doctors were losing 30% of their patients. Which homeopathic formulas are used in my weight loss program?? My weight loss patients are prescribed a homeopathic DETOX solution obtained through Remedia, a world-renowned homeopathic laboratory in Austria. Remedia Homeopathic stands for 250 years of the art of healing. What began in 1760, as a small family pharmacy is today an ultra modern undertaking. The production of highly effective homeopathic remedies has earned Remedia the highest reputation at an international level. The most modern methods of production guarantee these high standards. The quality of the hCG used in my clinic far surpass anything available in the United States. hCG purchased over the counter or online will certainly disappoint. I compiled a second amino acid formula, which I call MUSCLE MATRIX SUPPORT FORMULA. It provides additional metabolic support to help maintain muscle mass and revive youthful vigor. In my test run of the 26-day program with my 2 formulas, using my husband, my son and myself as the first patients, my husband lost 34 pounds, our son lost 22 and I lost 16 pounds! We were never hungry and felt happy and energized. Before testing the diet I analyzed the nutritional value of the foods that are allowed. It is a perfect chemical and nutritional balance. Both formulas are of the highest quality and are only available to my patients through my clinic. L-Ornithine helps to promote the release of growth hormone, which promotes the metabolism of excess body fat. The effect is enhanced when combined with L-Arginine and L-Carnitine. L-Carnitine is related to B vitamins. It helps to transport long-chain fatty acids, which are burned within the cells to provide energy. It is a main source of energy for the muscles, thus increasing the use of fat as an energy source. L-Arginine is important for muscle metabolism. This amino acid aids in weight loss because it facilitates increase in muscle mass and a reduction of body fat. It also retards the growth of tumors and cancer by enhancing immune function. L-Glutamine can readily pass the blood-brain barrier and promotes mental ability. It also assists in maintaining the proper acid/alkaline balance in the body. Beta-Alanine is supported by scientific studies. It increases muscular strength & power output, increases muscle mass, increases anaerobic and aerobic endurance, and delays muscle fatigue. Maca has been used traditionally to enhance fertility and sexual performance in both men and women and to relieve menopausal symptoms in women and prostate problems in men. It has been purported to treat cancer and to improve stamina in cancer patients. Pygeum Africanum benefits prostate and bladder health, has aphrodisiac properties, and reduces inflammation. Rhodiola is helpful in the treatment of cancerous tumors, cardiovascular disease, depression and fatigue. Astragalus benefits cardiovascular disease, chemotherapy side effects, common cold, diabetes, HIV and AIDS, immunostimulation, microbial infection, increases strength and stamina. The active ingredient in DETOX is a homeopathic (nano-dose) form of the metabolizing hormone, human chorionic gonadotropin. It triggers the safe and rapid release of nutrients store in fat, and helps eliminate hunger. The formula is used in combination with a detoxification diet compiled by an endocrinologist. The diet includes very specific, clean, unprocessed foods, which you can buy at the supermarket. You will lose weight quickly and comfortably. Most patients lose 2-3 times as much weight as they would by calorie restriction alone.